Ever wondered how to cut a mango? 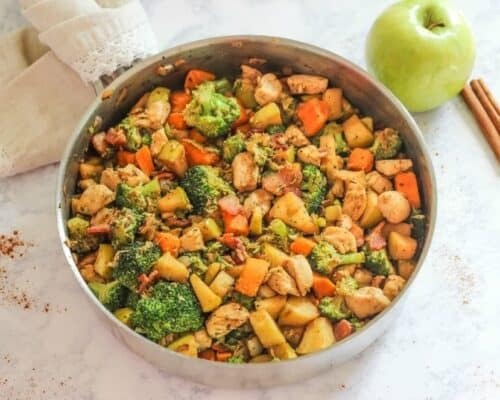 It’s so easy and takes less than 5 minutes to do! After following these simple steps, you’ll become a mango-cutting pro! There’s nothing like a fresh and juicy mango. 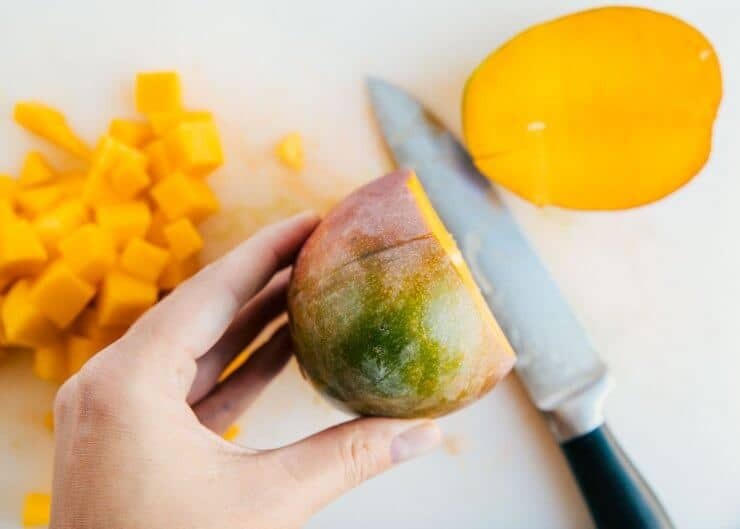 Mangoes are one of my favorite fruits and I love to incorporate them all types of recipes, especially fresh mango salsa and smoothie bowls. I used to never buy mangoes because I never knew how to cut them! Although they are one of my favorite fruits, cutting them can be somewhat intimidating. The good news is that it is actually SO easy to cut mangoes! Once you do it once, you’ll be a pro. 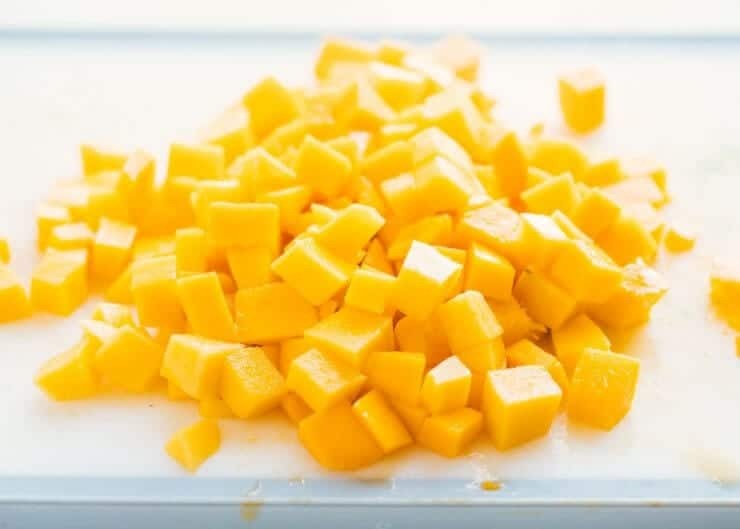 :) It takes less than 5 minutes and before you know it, you have perfectly diced mango pieces ready to eat. 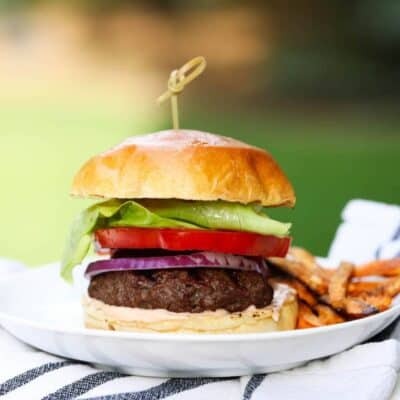 Mangoes are so juicy and delicious and add such a fresh, sweet flavor to any recipe. 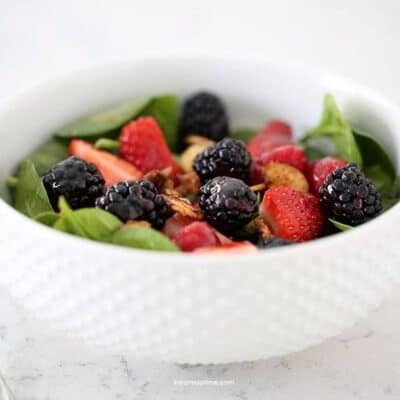 We love to add them to smoothies, salads, fruit salsa…you name it! They are also extremely delicious by themselves. I could snack on fresh mangoes all day! And let’s not even get started on dried mangoes. Those are dangerous! How do you cut a mango? 1. First, assemble the mango, knife and cutting board. Place your mango on the cutting board and determine which side is tallest. The mango seed (or pit) will be positioned along that side. Start by cutting off both sides of the mango along the mango seed. If your knife hits the seed, you may need to re-position it and try again. Once the sides are sliced, I like to also cut off the remaining mango flesh to gather the most mango as possible. Just make sure not to cut off part of the seed! 2. Holding one of the mango sides, use your knife to make lengthwise slices vertically down the mango towards the skin. Repeat the process horizontally. It’s important to note that you don’t want to cut through the mango skin. 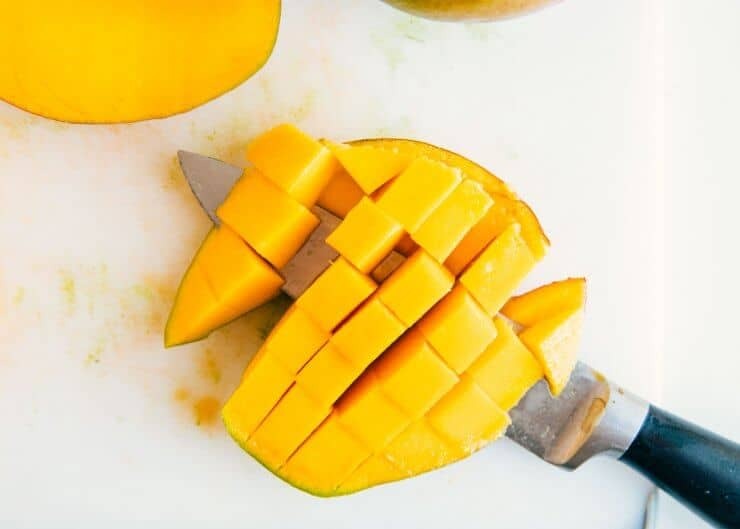 Use this cutting method on all mango pieces. 3. Next, turn the mango inside out by pushing out the center of the fruit through the skin. The mango pieces will pop up, making it easy to dice. 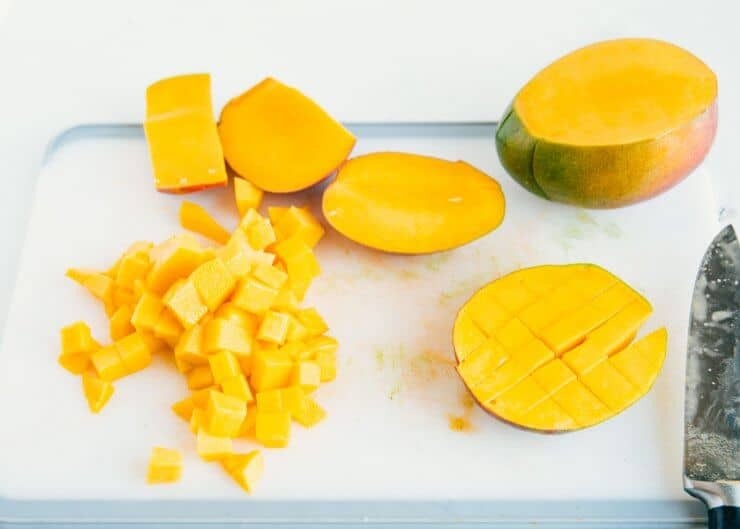 Just use your knife to cut the mango cubes away from the skin. 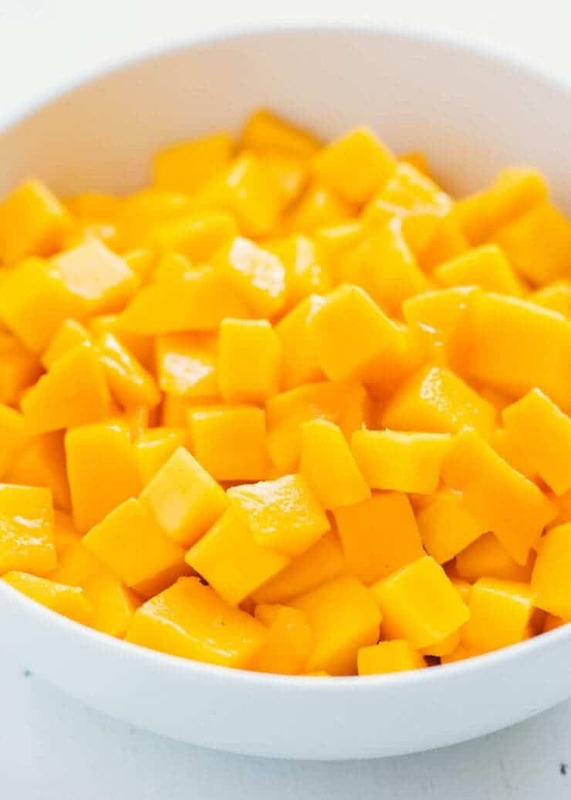 And there you have it, perfectly diced mangoes! How do you know when a mango is ready to eat? It can sometimes be a little tricky to tell if a mango is ripe and ready to eat. Below are a few tips that I use. The skin on most ripe mangoes is mostly red or yellow, with a couple of green spots. The more ripe the mango is, the less green color the skin will have. If the mango is soft to squeeze, that means it is ripe and ready to eat. If still hard, let it sit a couple more days. When a mango is ripe, there will often be a yellow circle around the stem. A ripe mango will smell fragrant, whereas a non-ripe mango won’t smell at all. Smoothies: Mangoes add such a nice tropical twist to smoothies. Try adding to this pineapple mango smoothie or mango smoothie bowl. 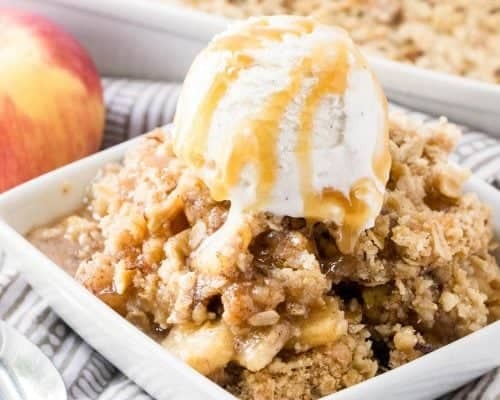 Oatmeal: I love the addition of sweet, juicy mango to cooked oatmeal or even overnight oats. Top with maple syrup, almond butter or even a dash of cinnamon for the ultimate breakfast. Salads: Salads taste so delicious topped with mango. I like to incorporate a mix of lettuce, mango, avocado, chicken and top with a honey lime vinaigrette. Fruit kabobs: Mango is a wonderful addition to fruit kabobs. I love to grill my fruit kabobs using this recipe. Salsa: There are so many different salsa recipes that mango would taste delicious in. A few of my favorites are black bean and corn salsa, mango salsa and fruit salsa. Fruit pizza: Try topping a fruit pizza recipe with mango for a fun, tropical twist. Gourmet Toast 6 Different Ways! I cut it that way too! And now I am totally craving mangoes! Ah… so that’s how! They are so slippery, I always worry I’m going to cut myself. Great tips, mangoes can be such tricky little devils! I love your technique! I’ll definitely try it out! great technique and walk-through, much better than my method of slicing off the skin before delving into the slippery pulp, kinda dangerous too, so thank you! Yes! We eat SO much mango in summer!! 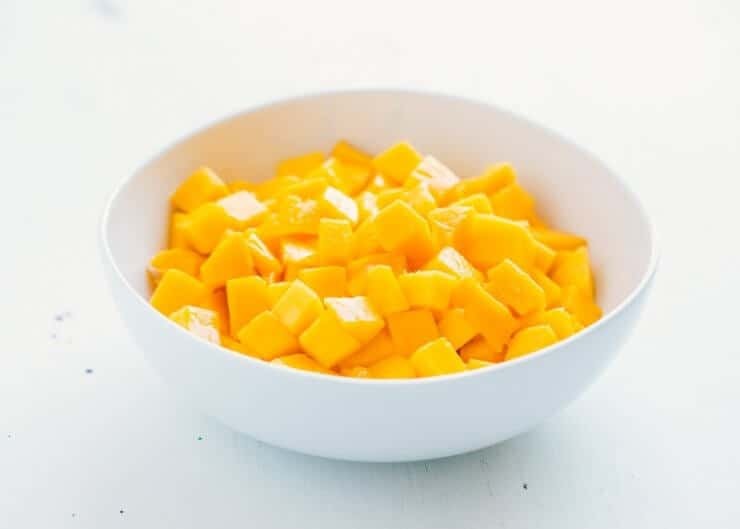 Mango is one of my favorite snacks! 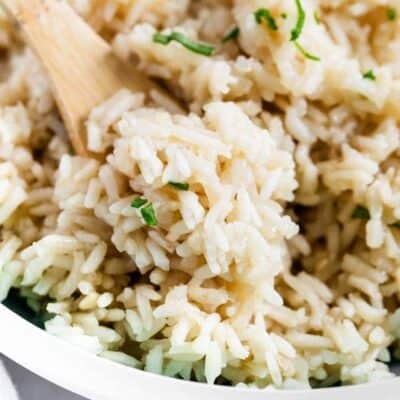 It feels like such a treat because I never mastered cutting it, love these tips! I totally needed this post! I can’t cut a mango to save my life!